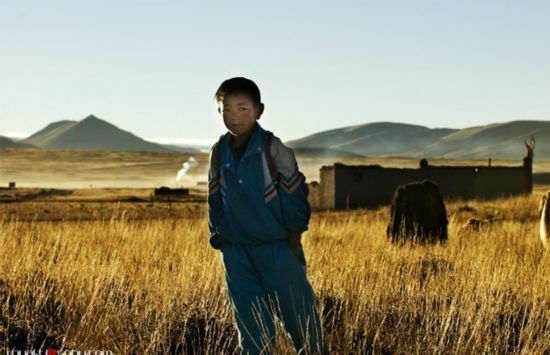 A Tibetan boy enjoys his morning on the Payang Prairie in Shigaste Prefecture, southwest China's Tibet Autonomous Region (TAR). Seventy-one km away from Zhongba County in Shigatse Prefecture of Tibet, Payang Township is a typical prairie-style small town in China's western region. Local residents enjoy their life on the peaceful and beautiful prairie. The west side of the highway is lined with golden sand dunes. Maquan Lake, the first largest lake on the upper reaches of the Yarlung Zangbo River can be seen in the middle section of the highway. Drivers should take care not to get their vehicles' wheels stuck into the sands beside the highway while enjoying the of the prairie, .